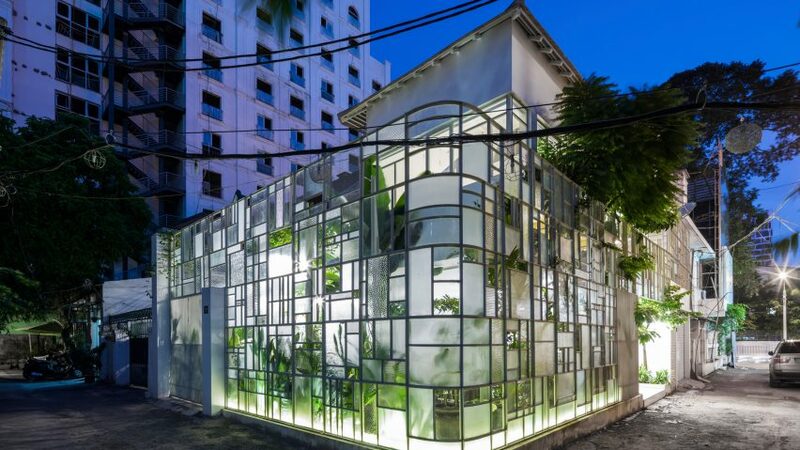 Vietnamese architecture studio Kientruc O has given a modernist makeover to an old house in a narrow Ho Chi Minh City alleyway, transforming it into a restaurant with a lush garden wrapped by gridded glazing. 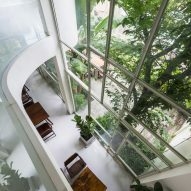 Kientruc O redesigned the 161-square-metre building to connect the house with the garden, and garden with the street, and to provide a dining area for customers. Plant fronds press up against abstract geometric pattern of alternating frosted, clear and channelled glass panels, with branches poking through frames that have been left empty. 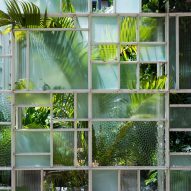 The walls of the building that face the planted areas are glazed in a corresponding pattern, but with only clear glass panels. 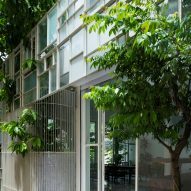 The gridded design provides interest for passerbys but the property remains screened by the frosted glass and leaves, while on the other side of the wall residents and customers have unimpeded views of the greenery. 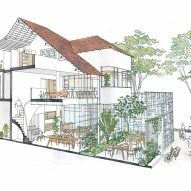 "Our focus when shaping this space was to create an environment that provoke emotional interactions with the architecture," said studio founder Đàm Vũ. 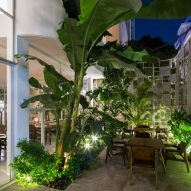 "The concept embodied the free and limitless character of space resulting in a humble and provocative sense of spatial purposes hinting toward the center of architecture being the subtle personal connection between the occupants, planters, furniture, and the garden," added the studio. The abstract geometric pattern of the walls was designed according to the architect Le Corbusier's theory of the Modulor scale, a system that attempted to reconcile human proportions to architecture, and the metric system with the imperial. Le Corbusier based the scale on a stylised male figure, combining double-height spaces, Fibonacci spirals and the Golden Ratio to create a complex grid of rectangles. 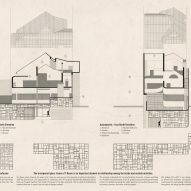 He applied the Modular to several of his buildings including the Claude et Duval factory in France. 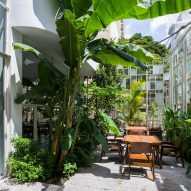 In Vietnam, the renovation project has been christened the T House, and the renovated ground floor turned into a restaurant. 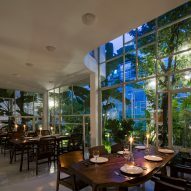 Dark wooden dining tables and chairs placed in front of the windows looking out in to the leafy garden. The curved garden wall screens a decked area with more seating, surrounded by vegetation on all sides. The interior and exterior have all been painted a uniform white, providing a minimalist blank canvas for the dark wood furniture and plants. 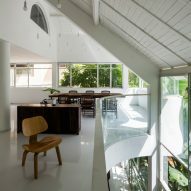 A curved staircase leads up to the second floor with a cutaway forming a balcony overlooking the ground floor and the garden. A large table for group dining occupies the main space, a double height volume that opens to the underside of the original gabled roof. The living quarters are at the rear of the building, with the master bedroom occupying the top floor. 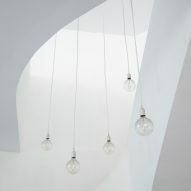 Kientruc O specialises in transforming properties that occupy narrow or awkward plots. 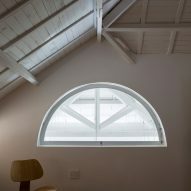 The recently renovated another house in the same city, carving an elliptical lightwell in the 1940s building and added a pool at the bottom. 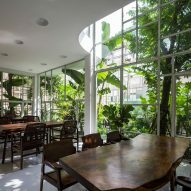 In 2015 the studio added a lightwell to a skinny house that was only 3.5-metres wide, planting a tree at the bottom of the D-shaped atrium.